Saudi Arabian permanent residence of the United Nations Ambassador (middle) and the United States permanent presence in the United Nations military officers, etc. US Ji’an TV Special Mission of the Permanent Mission of Sri Lanka to New York in New York: Yesterday (February 4) held a diplomatic reception at the mission office to celebrate Sri Lanka’s independence 71st anniversary. 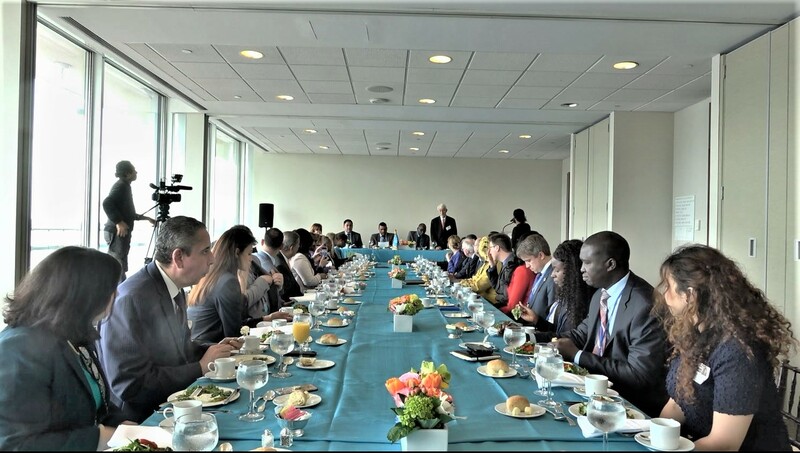 More than 300 senior officials, including permanent representatives, senior diplomats, senior United Nations officials, Sri Lankan professionals, members of the press and civil society, attended the meeting. The reception began with two foreigners, Dr. Esiri Karunaratne and Mr. Godfrey Tisseverasinghe, singing Sinhalese and Tamil international songs, followed by Sri Lankan Ambassador and Permanent Representative Dr. HE Rohan Perera gave a welcome speech. Ambassador Pereira said that Sri Lanka’s journey after independence is not without challenges. He pointed out: "We are faced with the challenges of conflict, the challenges of building, restoring and maintaining peace, and the challenges of achieving national development goals. "Independence celebrations are a reflection of these challenges, learning from them, and clarifying an appropriate time for a common vision for the future - building a fair, open and inclusive society with more respect The vision of nationality, multi-religion and pluralism. He said that this is the cultural character of our nation. Dr. Pereira finally assured the international community of Sri Lanka’s commitment to participation. He said that Sri Lanka has been an active member of the United Nations since joining the party 61 years ago and said that Sri Lanka will continue to work closely with the United Nations and its systems and procedures in different areas of peacekeeping and construction and equality. One ​​of the highlights of the evening was the highly acclaimed performance of the Schiller College New York City Choir, which performed two of Sri Lanka’s independence on the occasion of the 71st anniversary of Sri Lanka’s independence. Classical music, Lankaka and Dakuna Neganahira. Civil Society Briefing "Giving back to create inclusive and sustainable communities"
The Universal Declaration of Human Rights Turn 70 Today But Is it Still Relevant?